This is a complete revision and expansion of the fundamental text of Energy Kinesiology. Includes complete International Kinesiology College curriculum, plus Dr. Thie’s developments from 1990-2005. Integrates Metaphors of Muscles, Meridians and the Five Elements. With over a million copies in print since 1973, “Touch for Health” started a phenomenon that has flourished worldwide and contributed to the emerging profession of Energy Kinesiology, Energy Medicine and Energy Psychology. TFH has been taught in over 100 countries and 23 languages to help balance Posture, Attitude and Vital Energy to develop Wellness, Health Maintenance, Prevention, Relief from Stress, Aches & Pains and enjoyment of vibrant health. In-depth Goal Setting and Metaphor Balancing. Further tips on Muscle Testing.111 Sets of Metaphors covering 42 Muscles,14 acupuncture Meridians and the 55 concepts from the Chinese Five Elements in the TFH system. Balance energy and explore meanings related to goals, symptoms, and energy patterns. Contains all of the reference pages & follows the format of the Pocket Reference Folio, including detailed instructions for using the reference pages that are not included in the original Reference Folio. 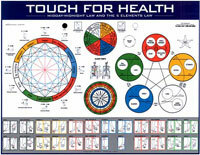 eTouch for Health (CD-ROM) is the electronic version of Touch for Health. eTouch is a session-creation and reporting system as well as a learning and research tool. Excellent for beginners and for the more-experienced practitioner needing an advanced tool in their practice. Includes Quicktime movies of Dr. Thie and Matthew Thie showing all 42 muscles tests. * NOTE the link will take you to etouchforhealth.com to buy directly. 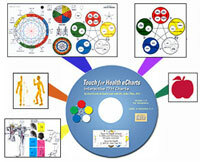 Large (43"x29") Full Color, Laminated Chart. Quick reference to all the reflex points, meridians, muscle locations (color coded with the testing positions), mid-day midnight graphic (24-hour Wheel). It enables anyone using TFH or other Kinesiological techniques to refresh their memory or demonstrate to clients, patients or friends what muscle is being tested and where they can massage, touch or trace reflexes and meridians to restore the natural subtle energy of each person. A must for your balancing or treatment area. It is easy to read, attractive and convenient, a valuable time-saving tool to facilitate the use of any body work. Contains the essence of the TFH Chart in a portable book form. Tabs can be cut for quick reference to each meridian. Each page illustrates a meridian, related muscles/tests, and all associated Reflex Points, including Spinal Reflex, Neurolymphatics, Neurovasculars and Acupressure Holding Points. Miniature version of the Folio - exactly the same information, but fits into a clinic jacket, coat pocket, purse, or your date book. Perfect resource for travel. Maintain your personal best on the road. Used to study the meridians individually. It has almost all the same information as the reference chart and the folios. When teaching ongoing classes it is handy to give this information session by session. (11”x17”, 2-sided, laminated) An incredible amount of information in a hand-sized reference chart. Laminated for easy marking of your Muscle imbalances and Energy patterns according to the 24-hour Cycle and the 5-Element Cycles. 24-hour Wheel, including 14 basic Muscle-tests, Peak Meridian Energy times and the following energy patterns: Triangles, Squares and Spokes. 5-element diagram with Shen and Ko (Creation and Control) relationships between the 12 bilateral Meridians. Reverse side shows: 111 Sets of Metaphor Questions related to Muscles, Meridians, and Chinese Five Elements. Explains basic concept of 24-hour Wheel, as well as 5-Elements : Ko Cycle, Shen Cycle, Alarm Points, Luo Points (Junction Points), etc. 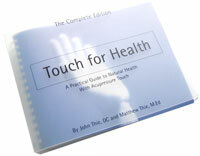 Remastered DVD of the classic Video of Dr. Thie introducing the concepts and demonstrating the techniques of Touch for Health. Graphic and live action video with Dr. John Thie. Great introduction to all the TFH energy balancing reflexes. Shows actual balancing session from start to finish with Dr. Thie helping set goals and reviewing the outcomes.